Cerium doped barium titanates, BaTi1-xCexO3 (x= 0.00, 0.02, 0.04, 0.06, 0.08, 0.10) have been prepared through solid state reaction route. Structural studies revealed a phase transition from tetragonal to cubic symmetry with increase in cerium content. Photoluminescence study revealed intrinsic presence of trapped holes and electrons i.e. Jahn-Teller bipolarons in the disordered structure leading to blue emission. Optical band gap values calculated from UV-visual diffuse reflectance spectra showed a decreasing trend with increase in Ce concentration. Disk shaped pellets were prepared using PVA as binder. 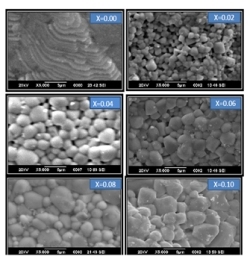 Scanning electron microscopy study showed clearly visible grains whose size increased with increase in doping concentration. Dielectric studies were performed over a wide temperature range from 15 K to 600 K at different frequencies. Normal ferroelectric character was obtained for all the compositions. A gradual decrease in the Curie temperature in coherence with structural studies was obtained with increase in Ce content. P-E hysteresis loops showed a domain pinning effect which increased with increase in doping content resulting in a decrease in the values of remnant polarization and coercive fields.